Brown ground beef in large saucepan or Dutch oven over medium-high heat until thoroughly cooked, stirring frequently. Drain. Add water; bring to a boil. Add potato slices; mix well. Boil over medium-high heat for 15 minutes, stirring occasionally. Stir in milk, sauce mix from packet and onions. Cook an additional 4 to 6 minutes or until mixture is thickened. Scalloped potatoes from scratch can take more than an hour to bake. Packaged potato mixes take only 20 minutes to cook. Just before serving, garnish this dish with purchased cooked bacon pieces. 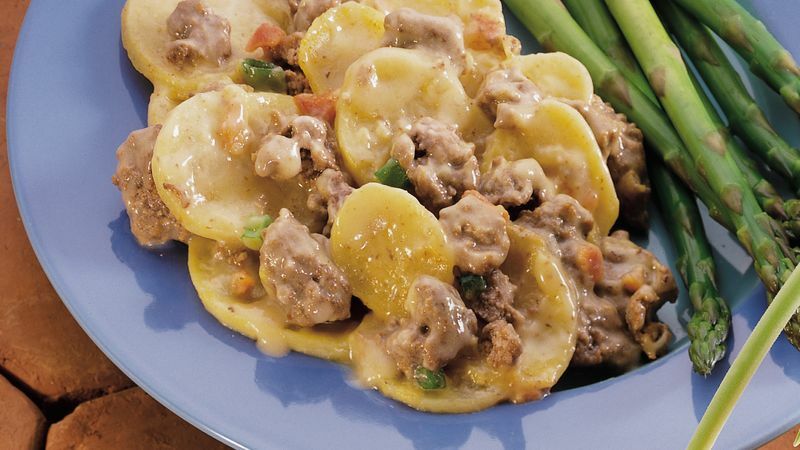 Serve this skillet meal with steamed asparagus spears.